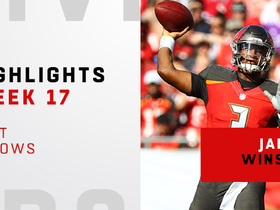 Ryan Fitzpatrick will get the starting nod over Winston for Sunday's game against the Panthers, Scott Smith of the Buccaneers' official site reports. Winston was pulled from Sunday's game in Cincinnati in favor of Ryan Fitzpatrick, but not before completing 18 of 35 passes for 276 yards, one touchdown and four interceptions. Winston completed 32 of 52 passes for 365 yards with no touchdowns and two interceptions in the Buccaneers' 26-23 overtime win over the Browns on Sunday. He also rushed 10 times for 55 yards and a touchdown and fumbled twice, recovering one and losing the other. Winston was designated with a hip injury on Wednesday's practice report but still turned in a full session, Carmen Vitali of the team's official site reports. Analysis: The designation is likely due to just some residual soreness that Winston picked up during his 2018 starting debut against the Falcons last Sunday, as the Buccaneers have not issued any other statements regarding the matter. Winston is fully expected to be available for Sunday's Week 7 tilt against the Browns after throwing for 395 yards and four touchdowns in a losing cause versus Atlanta. Winston completed 30 of 41 passes for 395 yards, four touchdowns and two interceptions during Sunday's 34-29 loss to Atlanta. He added 31 yards on the ground and fumbled twice, but neither was recovered by the defense. Winston will start against the the Falcons in Week 6 when the Buccaneers return from their bye, Greg Auman of The Athletic reports. Winston (suspension) started the second half of the Buccaneers' 48-10 loss to the Bears on Sunday and completed 16 of 20 passes for 145 yards with a touchdown and two interceptions. He also rushed once for seven yards. Winston (suspension) is active for Sunday's game against the Bears, but will serve as the backup quarterback with Ryan Fitzpatrick listed as the team's starter. The Buccaneers haven't named a starting quarterback for Sunday's game against the Bears, but "all signs point to" Ryan Fitzpatrick retaining the gig over Winston, Ian Rapoport of NFL Network reports. Winston's suspension was lifted by the commissioner Tuesday, according to the NFL's official transaction report. Analysis: As anticipated, Winston was able to return to the team's facility Tuesday, but he doesn't enter the building as the unanimous favorite to take over as starting quarterback. Ryan Fitzpatrick performed at a high level in Winston's absence, passing for at least three touchdowns and 400-plus yards in each start, leading the Buccaneers to a 2-1 record. More should be made clear about the competition once both quarterbacks take the field for practice Wednesday. Winston (suspension) is eligible to return to the Buccaneers' 53-man roster Tuesday, but it remains uncertain if he'll start over Ryan Fitzpatrick in Sunday's game at Chicago, Austin Knoblauch of NFL.com reports. 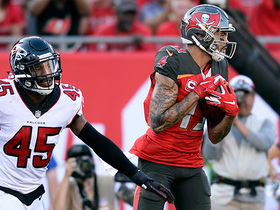 "Let's see what the injury report [says when it] comes back," head coach Dirk Koetter said after Monday's 30-27 loss to the Steelers, regarding his thoughts on the quarterback situation. "Any time we have these games, it's not always obvious how the guys are going to come in the next day and come in on Wednesday. Let's see what happens. I'd love to get a chance to talk to Jameis face-to-face before I tell the rest of the world." 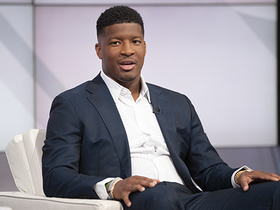 Winston (suspension) is being sued in relation to the allegations that resulted in a three-game suspension from the NFL, Jenna Laine of ESPN.com reports. Winston (suspension) isn't guaranteed the starting job upon his Week 4 return in the opinion of general manager Jason Licht, Jenna Laine of ESPN.com reports. "[If] Ryan Fitzpatrick, Ryan Griffin, whoever it is, is playing lights out, I don't think it's fair right now just to say, 'Yes, automatically, [Jameis] is going to be the guy,'" Licht said. "Now, he may be. Dirk and I -- Dirk in particular -- he's got some time to think about that." Winston won't take the field for Thursday's preseason game versus the Jaguars, Greg Auman of The Athletic Tampa Bay reports. Analysis: Winston will head into the regular season with an impressive line from three exhibitions -- 30-for-41 passing for 388 yards and three touchdowns versus no interceptions -- but a three-game suspension awaits him. While he's away from the team, Ryan Fitzpatrick will helm the Buccaneers offense. Winston is eligible to return Sunday, Sept. 30 at Chicago. Winston (suspension) completed six of 10 passes for 60 yards and a touchdown in Friday's preseason game against the Lions. Winston (suspension) completed 13 of 18 passes for 226 yards with two touchdowns and no interceptions in the Buccaneers' 30-14 preseason win over the Titans on Saturday. Winston (suspension) entered the game on the Buccaneers' third possession in a 26-24 preseason win over the Dolphins on Thursday. He completed 11 of 13 passes for 102 yards with no touchdowns or interceptions. Winston (suspension) received reps with all three offensive units during the Buccaneers' first practice of training camp Thursday, Scott Smith of the team's official site reports. 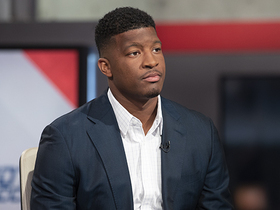 Winston (suspension), whose $20.9 million fifth-year team option for 2019 is only guaranteed against injury, could be released by the team for any other reason at any time before March 13 of next year without related financial penalty, Jenna Laine of ESPN.com reports. Winston will not appeal his three-game suspension for violating the NFL's personal conduct policy, Albert Breer of TheMMQB.com reports. Analysis: Winston -- who issued a statement Thursday apologizing for the incident that led to his suspension -- will thus be eligible to make his regular-season debut Sept. 30, when the Buccaneers face the Bears in Chicago. In his absence, veteran signal-caller Ryan Fitzpatrick is slated to start the team's first three contests in 2018. In the meantime, Winston is permitted to participate in all of the Buccaneers' preseason activities, including games. The NFL suspended Winston three games for a violation of the personal conduct policy, Adam Schefter of ESPN reports. The Buccaneers have picked up the fifth-year option on Winston's rookie contract, locking him in for 2019 at a $20.922 million salary that's only guaranteed against injury, Rick Stroud of the Tampa Bay Times reports. Winston was involved in a car wreck recently and ultimately was cited for careless driving, The Atlanta Journal-Constitution reports. Analysis: Despite Winston being partially at fault for the wreck, a punishment from the NFL is not expected and he escaped uninjured. The 24-year-old will head into the 2018 season on the last remaining year of his contract. Winston completed 28 of 51 passes for 363 yards with one touchdown and three interceptions in Sundays' 31-24 win over the Saints. He also posted 32 yards and scored a touchdown on five rushes. Winston completed 21 of 27 passes for 367 yards with one touchdown and no interceptions in Sunday's 22-19 loss to the Panthers. He also rushed three times for six yards and lost three fumbles. Winston completed 27 of 35 passes for 299 yards and three touchdowns in Monday night's 24-21 loss to the Falcons. He also rushed three times for 18 yards. Winston completed 26 of 38 passes for 285 yards with two touchdowns and two interceptions in Sunday's 24-21 loss to the Lions. He also lost a fumble. Winston (ankle) does not have an injury designation heading into Sunday's Week 14 tilt against the Lions, Jenna Laine of ESPN.com reports. Analysis: Winston was listed as a full participant in practice throughout the week despite apparently battling a sore ankle, but his lack of a designation on the final report of the week unequivocally confirms his availability for Sunday's game. The third-year quarterback made a successful Week 13 return from a three-game absence due to a shoulder injury, throwing for 270 yards with two touchdowns and no interceptions in the overtime loss to the Packers. Winston practiced fully Wednesday despite being listed on the injury report with an ankle issue. Winston (shoulder) completed 21 of 32 passes for 270 yards with two touchdowns and no interceptions in Sunday's 27-20 overtime loss to the Packers. He also rushed five times for 18 yards, fumbled twice (losing one) and logged a pair of fumble recoveries. As expected, Winston (shoulder) is active for Sunday's Week 13 tilt against the Packers. Analysis: Winston went through practice without restrictions this past week and had been officially named the starter, so this merely serves as final confirmation of his active status. He'll jump back into action after a three-game absence against a Packers squad that's allowed an average of 259.4 passing yards per game to quarterbacks. Winston (shoulder) is listed as questionable for Sunday's game in Green Bay, Tom Silverstein of the Milwaukee Journal Sentinel reports. Analysis: Winston was a full practice participant throughout the week and has already been named as the starter for Sunday. He'll return from a three-game absence to take on a Green Bay defense that's allowed quarterbacks to complete 68.8 percent of passes at a clip of 7.8 yards per attempt. The Bucs seemingly kept Winston on the injury repot just in case he suffers an unexpected late setback. Winston (shoulder) practiced fully Wednesday, Jenna Laine of ESPN.com reports. 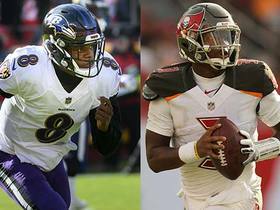 Analysis: Winston fulfilled the expectation he'd handle all the first-team work, which comes on the heels of head coach Dirk Koetter naming him the starter for Sunday's visit to Green Bay, according to James Palmer of NFL Network. As he prepares to bring a three-game absence to an end, Winston will focus on a Packers defense that has given up 259.4 yards passing per game and 17 touchdown tosses to quarterbacks across 11 contests in 2017. 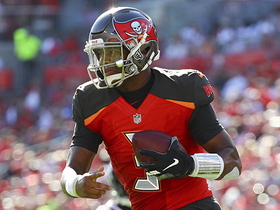 Head coach Dirk Koetter called Winston (shoulder) the Buccaneers' starting quarterback for Sunday's contest at Green Bay, James Palmer of NFL Network reports. Analysis: The Buccaneers haven't released their first Week 13 injury report, but Winston was expected to handle every rep with the first-team offense Wednesday, implying a full practice was likely, per Rick Stroud of the Tampa Bay Times. Naming Winston the starter lends credence to this assumption as he prepares for the Packers' 25th-ranked pass defense. Winston (shoulder) will practice Wednesday and is expected to handle all of the reps with the first-team offense, Rick Stroud of the Tampa Bay Times reports. Winston (shoulder) did some rehab work Monday and will resume practicing Wednesday if he doesn't feel any soreness, Rick Stroud of the Tampa Bay Times reports. Winston (shoulder), who will miss his third straight game Sunday against the Falcons, could return for the Buccaneers' Week 13 matchup with the Packers, Ian Rapoport of NFL Network reports. Winston (shoulder) will not return for Sunday's game in Atlanta, Jenna Laine of ESPN.com reports. Analysis: Winston was reevaluated Monday and ruled out for at least one more game. 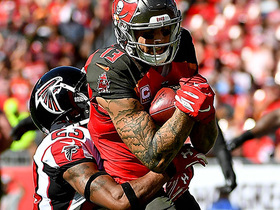 The Bucs will take things on a week-to-week basis, likely opting for a cautious approach unless they miraculously climb back into the playoff picture. Ryan Fitzpatrick just led the team to back-to-back wins, albeit against the Jets and Dolphins with a major assist from the Tampa Bay defense. Still recovering from an AC joint sprain as well as a rear deltoid injury, Winston has yet to resume football activities. Winston (shoulder) will be reevaluated this week, Jenna Laine of ESPN.com reports. Buccaneers head coach Dirk Koetter told SiriusXM NFL Radio on Friday that Winston received a platelet-rich plasma injection about a week ago to address the AC joint sprain in his throwing shoulder. At this stage, the Buccaneers have no plans to shut Winston (shoulder) down for the rest of the season. Analysis: Coach Dirk Koetter relayed Monday that the expectation remains that Winston will play again this season, but for now the QB is resting his throwing shoulder and Ryan Fitzpatrick will remain the team's starting signal-caller in Week 11, backed up by Ryan Griffin. Once Winston's shoulder is re-evaluated, the Bucs will determine how best to move forward with their franchise QB, but at this juncture it remains to be seen exactly when that will transpire. Winston indicated that no new damage to his right shoulder was detected after he met with Dr. James Andrews in Pensacola, Fla. on Tuesday, Rick Stroud of the Tampa Bay Times reports. "Part of the protocol," Winston said Wednesday, regarding the visit for the second opinion. "I mean, all the doctors are working together to come up with what they think. All I know is for the next two weeks, I'm going to be rehabbing and getting my shoulder 100 percent. That's all I can say." Analysis: Though Winston could require surgery if he doesn't respond to rehab work as well as the Buccaneers anticipate, for now, the team is hoping that two weeks off to rest his throwing shoulder will be all the quarterback needs to heal up. 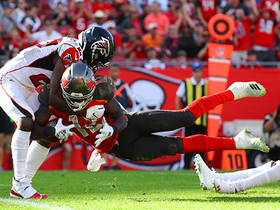 Ryan Fitzpatrick is slated to start for the team while Winston recuperates, but with top wideout Mike Evans (suspension) set to miss Sunday's matchup with the Jets, Fitzpatrick's fantasy upside looks fairly limited. Winston met with Dr. James Andrews on Tuesday for further evaluation on his injured right shoulder, Greg Auman of the Tampa Bay Times reports. Winston (shoulder) will be shut down for at least two weeks, Jenna Laine of ESPN.com reports. Analysis: For the second time in four games, Winston didn't log a second-half snap as the team's medical staff made an executive decision to rule him out Sunday in New Orleans. A subsequent MRI revealed damage aside from the previously-known AC joint sprain in his right throwing shoulder, spurring Monday's development. While Winston turns his focus to rehabilitation, the Bucs will give Ryan Fitzpatrick at least a few opportunities to direct the offense, starting Sunday versus the Jets. Winston required X-rays and an MRI after Sunday's loss to the Saints for the AC joint sprain in his throwing shoulder along with a rear deltoid issue, Ian Rapoport of NFL Network reports. Winston said he aggravated the AC joint sprain in his right shoulder injury during Sunday's 30-10 loss at New Orleans, Tom Pelissero of NFL.com reports. Winston was forced out of Sunday's game against the Saints with a shoulder injury. Analysis: With Winston nursing a shoulder issue, Ryan Fitzpatrick took over at QB for the Bucs on Sunday. Prior to his exit from the contest, Winston had completed seven of 13 pass attempts for 67 yards. Winston (shoulder) is active for Sunday's Week 9 tilt against the Saints, Scott Smith of the team's official site reports. Analysis: As expected, Winston will play through the AC joint sprain in his throwing shoulder for the third straight game. He's produced markedly different results over the first two contests in which he's been affected by the injury, and the Buccaneers and fantasy owners will certainly hope his Week 9 effort doesn't resemble last Sunday's 210-yard, two-interception afternoon against the Panthers in any way. 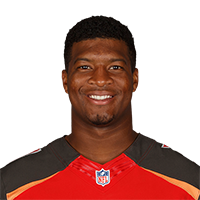 Winston (shoulder) will start at quarterback Sunday against New Orleans, a source told Adam Schefter of ESPN. Analysis: Winston is listed as questionable on the official injury report. He was a limited participant in practice Wednesday and Thursday but a full participant Friday. He may still have a bit of soreness due to the AC joint sprain he suffered in Week 6, but there's never been much question Winston will start. 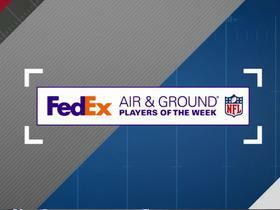 He'll take aim at an improved Saints defense that's surrendered just one 200-yard passing game since Week 2. Winston (shoulder) was a full practice participant Friday and is listed as questionable for Sunday's game in New Orleans, Greg Auman of the Tampa Bay Times reports. Winston (shoulder) was a limited participant at Wednesday's practice, Jenna Laine of ESPN.com reports. Winston (shoulder) threw during the portion of Wednesday's practice open to the media, Scott Smith of the Buccaneers' official site reports. Analysis: Since suffering an AC joint sprain in his right throwing shoulder Week 6, Winston has followed a strict regimen of no throws until Friday, so he appears to be in a better spot than the last two weeks. It remains to be seen if he'll be able to log a full practice, which will be confirmed during the release of Wednesday's injury report. 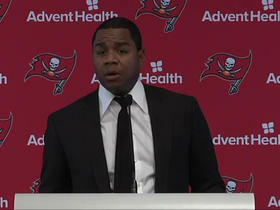 Achieving such status would more or less clear Winston for Sunday's divisional game at New Orleans, barring a setback. Winston is nursing some soreness with his right shoulder, but is set to practice Wednesday, Rick Stroud of the Tampa Bay Times reports.